The definition of basketball is a game played by two 5-player teams, the object of which is to get the ball through the opposing player's hoop the most times to score the most points, or a large ball that is used in the game. An example of basketball is the game played by Michael Jordan. An example of a basketball is the orange and black ball that is used during the game of the same name. "basketball." YourDictionary, n.d. Web. 13 April 2019. <https://www.yourdictionary.com/BASKETBALL>. invented and named (1891) by James A. Naismith (1861-1939) at Y.M.C.A. College, Springfield, Mass. A game played between two teams of five players each, the object being to throw a ball through an elevated basket on the opponent's side of a rectangular court. Players may move the ball by dribbling or passing with the hands. The inflated, spherical ball used in this game. (sports, uncountable) A sport in which two opposing teams of five players strive to put a ball through a hoop. 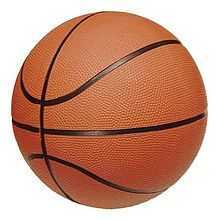 (basketball, countable) The particular kind of ball used in the sport of basketball.